Virginia Professional Wildlife Removal Services, LLC., is Licensed and Insured, and provides both residential and commercial Bat Removal & Bat Control services. Luray VA bat removal control services is provided by our local bat pros in Luray and throughout Shenandoah County Virginia. Did you know that Virginia Professional Wildlife Removal Services, LLC is the ONLY area bat removal and control company where all of our employees are NWCOA Bat Standards Compliant Certified. We perform bat exclusions, individual bat removal, and bat guano clean-up services throughout the State of Virginia – including the Luray, VA and Shenandoah County areas. Virginia Professional Wildlife Removal Services is registered with and recommended by Bat Conservation International as Bat Exclusion Professionals. Virginia Professional Wildlife Removal Services employee technicians who view bats as the beneficial animals that they are, and make every effort to exclude bats from buildings in a safe and effective manner. Our bat experts are also knowledgeable and experienced with safe bat guano clean-up techniques and procedures. At Luray Virginia Bat Removal and Bat Control Services we are constantly striving to advance our education so that we may serve you better. If you have a bat colony in the attic of your Luray Virginia home in Shenandoah County, call Virginia Professional Wildlife Removal Services today and schedule a site visit. We can safely remove the bats from your home, and make sure that the bats do not return. We do not normally perform bat exclusions from May through August. This is the bat birthing period in our area. Do you have a bat in your Luray Virginia home? First, if possible isolate the bat to one room, then call your local Animal Control Officer (They normally work in the sheriff’s office) who will normally remove the bat for you and submit it for rabies testing. Then contact our professional bat removal staff who can advise you on the proper steps to take for safely removing bats in the attic. If the bat has made contact with any person or pet, it will need to be tested by the Virginia Health Department for rabies. Bats often fly about swimming pools, from which they drink or catch insects. White light (with an ultraviolet component), commonly used for porch lights, building illumination, street and parking-lot lights, may attract flying insects, which in turn attract bats. Unfortunately, the mere presence of a bat outdoors around Luray Virginia structures is sometimes beyond the tolerance of some uninformed people. Information is a good remedy for such situations. Bats commonly enter Luray VA buildings through openings associated with the roof edge and valleys, eaves, apex of the gable, chimney, attic or roof vent, dormers, and siding. Other openings may be found under loose fitting doors, around windows, gaps around various conduits (wiring, plumbing, air conditioning) that pass through walls, and through utility vents. Bats in Luray Virginia and other areas of Shenandoah County are able to squeeze through narrow slits and cracks. For purposes of bat management, one should pay attention to any gap of approximately 1/4 x 1 1/2 inches (0.6 x 3.8 cm) or a hole 5/8 x 7/8 inch (1.6 x 2.2 cm). Such openings must be considered potential entries for at least the smaller species, such as the little brown bat. The smaller species require an opening no wider than 3/8 inch (0.95 cm), that is, a hole the diameter of a US 10-cent coin (Greenhall 1982). Openings of these dimensions are not uncommon in older wood frame structures where boards have shrunk, warped, or otherwise become loosened. 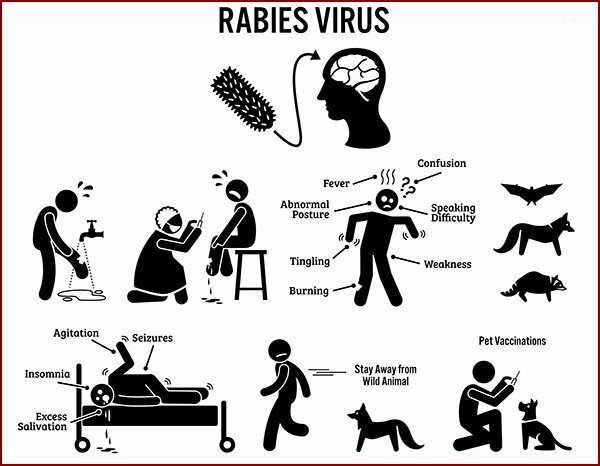 Rabies – Bats are distinct from most vertebrate pests that inhabit human dwellings in Luray VA because of the potential for transmitting rabies — a viral infection of mammals that is usually transmitted via the bite of an infected animal. Rabies does not respond to antibiotic therapy and is nearly always fatal once symptoms occur. However, because of the long incubation period (from 2 weeks to many months), prompt vaccination following exposure can prevent the disease in humans. Dogs, cats, and livestock also can be protected by periodic vaccinations. Bats are not asymptomatic carriers of rabies. After an incubation period of 2 weeks to 6 months, they become ill with the disease for as long as 10 days. During this latter period, a rabid bat’s behavior is generally not normal — it may be found active during the daytime or on the ground incapable of flying. Most human exposures in Luray VA are the result of accidental or careless handling of grounded bats. Even less frequently, bats in this stage of illness may be involved in unprovoked attacks on people or pets (Brass, pers. commun. ; Trimarchi et al. 1979). It is during this stage that the rabid bat is capable of transmitting the disease by biting another mammal. As the disease progresses the bat becomes increasingly paralyzed and dies as a result of the infection. The rabies virus in a carcass is reported to remain infectious until decomposition is well advanced. 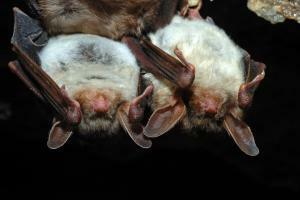 Rabies is the most important public health hazard associated with bats in Shenandoah County. Infection with rabies has been confirmed in all 40 North American species of bats that have been adequately sampled in all of the contiguous United States and in most provinces of Canada. Histoplasmosis – Histoplasmosis is a very common lung disease of worldwide distribution caused by a microscopic fungus, Histoplasma capsulatum. Histoplasma exists in nature as a saprophytic mold that grows in soil with high nitrogen content, generally associated with the guano and debris of birds (particularly starlings, Sturnus vulgaris, and chickens) and bats. Wind is probably the main agent of dispersal, but the fungus can survive and be transmitted from one site to another in the intestinal contents of bats, and also in the dermal appendages of both bats and birds. The disease can be acquired by the casual inhalation of windblown spores, but infections are more likely to result from visits to point sources of growth of the fungus. Relative to bats, such sources include bat roosts in caves, barns, attics, and belfries, and soil enriched with bat guano. Untrained homeowners should NEVER attempt to remove or clean up bat droppings.